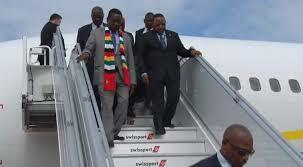 Zimbabwe must consider buying President Emmerson Mnangagwa a jet since the cost of his foreign trips on chartered planes was too high as compared to his predecessor Robert Mugabe, former Finance minister Tendai Biti said. “Why do we have to hire a jet for $2 million to $3 million from Switzerland whenever anyone travels?” Biti questioned at an Institute of Chartered Accountants of Zimbabwe (ICAZ) conference to mark the institute’s 100th anniversary in Harare yesterday. “Mugabe was even better because he abused Air Zimbabwe. It is actually cheaper to buy a jet for Mnangagwa to travel. We have hired a jet to fly to Djibouti, America and other countries. I heard Grace Mugabe saying she had never seen a jet like that (the gulf stream hired for the former first lady to travel for her mother’s funeral). If you hear people like Grace... saying that, it means this has become too much,” Biti said.